Red Magic 2 Gaming Phone Key Features Confirmed - Playfuldroid! Xiaomi has recently launched the Black Shark Helo as it second gaming focused smartphone. On the day Black Shark Helo was announced, Nubia confirmed that it will be soon launching the Red Magic 2 smartphone. Today, it has released another teaser to confirm on some of the features of the Red Magic 2. The Nubia Red Magic gaming phone that was announced in April was driven by Snapdragon 835 chipset. Hence, it is speculated that the upcoming Nubia Red Magic 2 will be fueled by Snapdragon 845 chipset. The fresh poster released by Red Magic confirms that its upcoming smartphone will be indeed powered by Snapdragon 845. 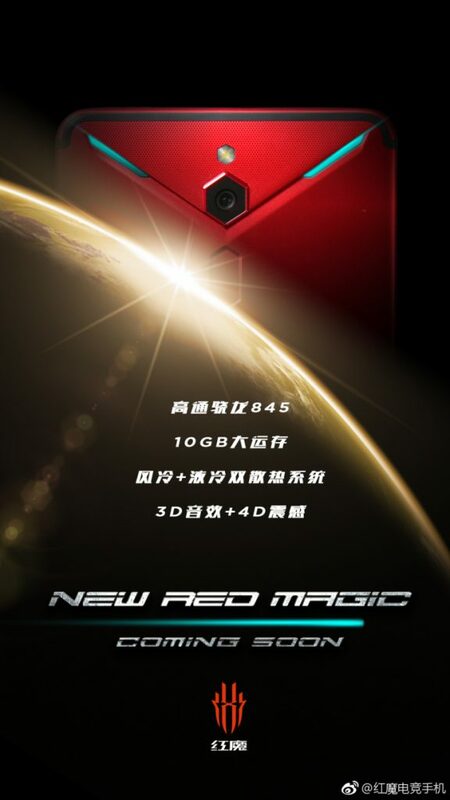 Like the Black Shark Helo phone, the Red Magic 2 smartphone will be also equipped with 10 GB of RAM. For heat dissipation, the handset will be equipped with dual cooling system that will comprise of air cooling and liquid cooling. For topnotch gaming experience, the phone will offer features like 3D surround sound and 4D shock. The other specifications of the smartphone are under the wraps now. Its arrival may not be far away since the company has slashed the pricing of the original Red Magic gaming phone by 200 Yuan. Nubia will be launching the Nubia X smartphone on Oct. 31. It is likely that the Red Magic 2 may go official soon after the launch of Nubia X.